Is it all the effect of what happened? Shirley wrote to me yesterday. I have IBS, possibly caused by a traumatic road accident when I was 18, but I also suffer recurring sinus and ear problems as well as acid reflux and low appetite. My dad passed away over 2 years ago which was also very traumatic for me, and I wonder whether all these physical symptoms are somehow related to grief and sadness? So many people these days suffer from a range of symptoms often in different parts of the body. The medical response to Shirley’s cycle of symptoms would be to divide them up into separate diagnoses, even allocate them to separate appointments, and treat each individually; laxatives or prokinetic drugs for her constipation, Gaviscon or acid blockers for her acid reflux, antibiotics and steroids for her sinus and ear problems and perhaps an appointment with a dietitian to advice on management of her low appetite and IBS. But these symptoms all seem to occur together. But Shirley knows seems to know what is wrong. Most people do, but they can be put off by fears of what each symptom might represent. Shirley suspects her IBS was instigated by the road accident she survived when she was 18, but the recent death of her father has hit her badly and made everything worse. She asks whether all her symptoms could be caused by grief or sadness. I suspect that with a few caveats, she is correct, but trauma can go on for a long time and she is not out of the wood yet. Let’s consider what we know about the sequelae of trauma – what the evidence tells us. Unresolved trauma, which includes grief, is often played out in bodily symptoms. 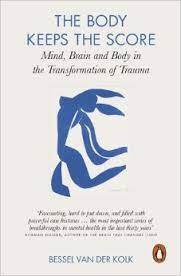 As Trauma Supremo, Dr Bessel van der Kolk says, it’s the body that keeps the score. The reason is that trauma activates the more basal parts of brain, the subcortical limbic system and the nuclei in the brain stem. These areas generate feelings of sadness, fear, anger and other emotions which are accompanied by bodily symptoms and reastions mediated by the autonomic (sympathetic and parasympathetic) nervous system and the release of cortisol. So whenever Shirley’s feelings overwhelm her, then she experiences a flare up of her typical symptoms and bodily reactions that might include swelling of the lining of the sinuses and depression of the immune system, which may presage another bout of sinusitis. Once she starts another cycle of symptoms, she feels awful but has to let it run its course or respond to treatment before things clear. Of course, the treatments could complicate things; the antibiotics could upset her bowels, the steroids exacerbate acid reflux, etc. If so many unexplained bodily illnesses or symptoms are the result of what has happened to them, then it begs the question, why does one person experience trauma in the bowels, another in the stomach, another in the back and so on? There are several possible reasons. Some symptoms are hard wired to particular emotions. Just think of how we experience sadness as a pricking around the eyes, the shedding of tears and a lump in our throats, or how we feel anger as a tightness in our chests, embarrassment as a flushing of the face and throat, anxiety as butterflies in our stomach or diarrhoea and desire as genital swelling and lubrication. Sometimes the symptoms of an injury or an illness that is going on at the time may be recruited to express the memory of what happened. Think of the headaches or lapses of consciousness that can occur after concussion, post traumatic back or neck pain, the continued pelvic pain after hystectomy or the IBS-D that develops and persists after an attack of gastroenteritis. Then there are some symptoms that can express the meaning of what happened. These include post traumatic blindness or paralysis or the bloating that may persist after a lost pregnancy. It is not only that trauma activates the centres in the brain stem (the inner chimp), it also causes the frontal cortex, the more human part of the brain that can think make connections, plan and resolve things to go off line. So all trauma survivors are left with is the bodily symptoms, which are so bad they just need a doctor to cure them. In time they may be able to recover and get on with their lives, but the memory of what happened and the way they felt remains shut away only to be rekindled by anything that reminds them of the context of what happened, a letter, a visit, a particular meal, a car journey, and then the symptoms flare up all over again. I am not ‘mystic Nick’ and I can’t know whether this is actually what has happened to Shirley. All I can say is that trauma is common. It is said to affect 3 out of every 5 people before the age of 18 and probably few of us escape it by the age of 30. And those that have been traumatised once are more susceptible to further traumatic situations. I am not saying that these people have all suffered what might be considered generally as major trauma; violent or sexual abuse, war, imprisonment, the point is that whether it was an argument, a job loss, the failure in an exam, the collapse of a love relationship, estrangement from one’s children, it was major trauma for them, bad enough for them not to be able to think about it or deal with it. We would have to live a very sheltered life to avoid trauma. The effects are more long lasting if they occur early in life, especially before memories or identity is properly developed. If the effects of trauma are expressed through bodily symptoms because they cannot be thought or talked about, it stands to reason that many people with post traumatic IBS and other post traumatic symptoms must deny that trauma or stress has anything to do with it. This poses a major philosophical problem for doctors and other health care workers. Either they agree with the patient’s interpretation and attempt to treat the symptoms with medical solutions, which might be seen as a form of collusion which may trap the patients in the illness that can never be resolved, leaving them frustrated with their doctors. Or they try to find some subtle way to bring the thinking part of the brain on line so that the patient is able to heal themselves. Shirley has been able to think about her symptoms. The chances are with support and appropriate help, she will continue to move along that trajectory and recover. Others could remain stuck in the medical system. There is, however, always hope, even for IBS that torments a person’s life day in and day out for years. People can get over it. In another blog, I will talk about how it is possible for somebody with IBS or any other serious unexplained illness to grow out of the pain and heartbreak and recover their life. I suffer very similar symptoms to Shirley and mine is also a consequence of a high stress point in my life 3 years ago. Unfortunately, even though the stressful incident has resolved itself fully, I am still living with its effects. I think the stress of feeling so poorly exacerbates it too, like a vicious cycle. It’s tough to see a way out. Feel better soon, Shirley. Thank you for sharing this Caroline. It helps people with IBS understand what can happen and if it applies to them, how they might be able to reduce the effects. I will be writing about that in the next few days. . This entry was posted on October 22, 2015 by nickwread in Post Traumatic IBS and tagged Irritable Bowel Syndrome, my story, Trauma.